Armament 1 x 8"/40, 2 x 6"/40, 8 x 4"/40 12 x 6pdr, 4 x 1pdr, 4 x 14" tt..
Armor, 4" Shields, 4" Deck, 5" Conning Tower. Speed, 21 Knots, Crew 477. 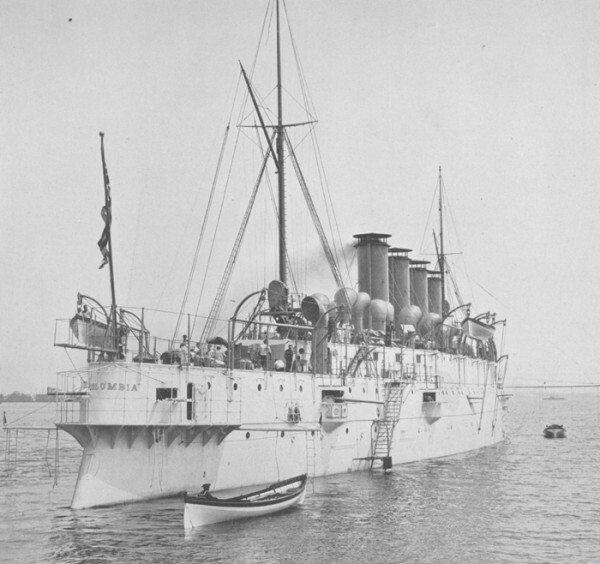 USS Columbia (Cruiser No. 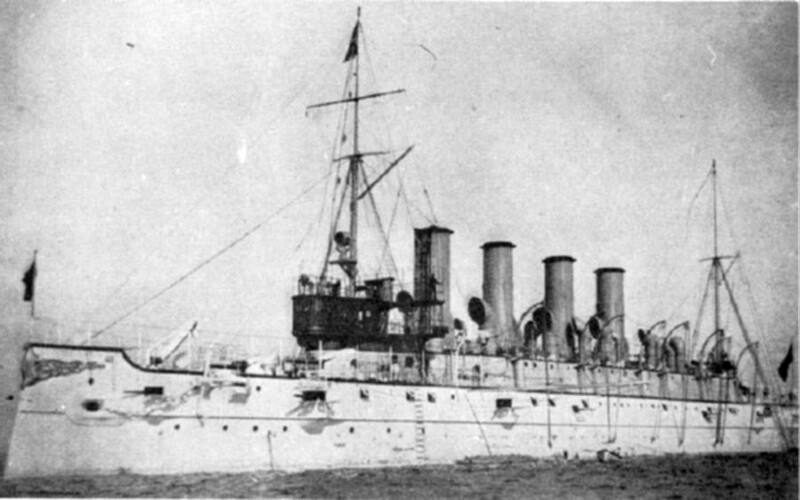 12) At anchor, during the 1890s. U.S. Naval Historical Center Photograph #55292 .
c1216 157k USS Columbia (Cruiser No. 12) circa 1890s. 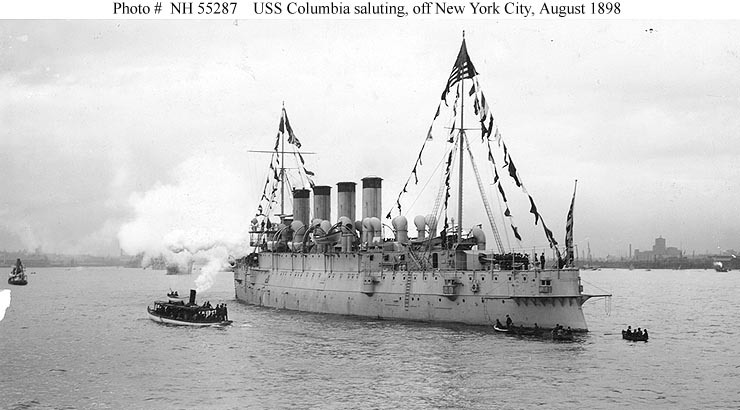 USS Columbia (Cruiser No. 12) Running trials in 1893, before she received her guns. U.S. Naval Historical Center Photograph #66297. Bows-on view while at anchor on 13 November 1894, location unknown. 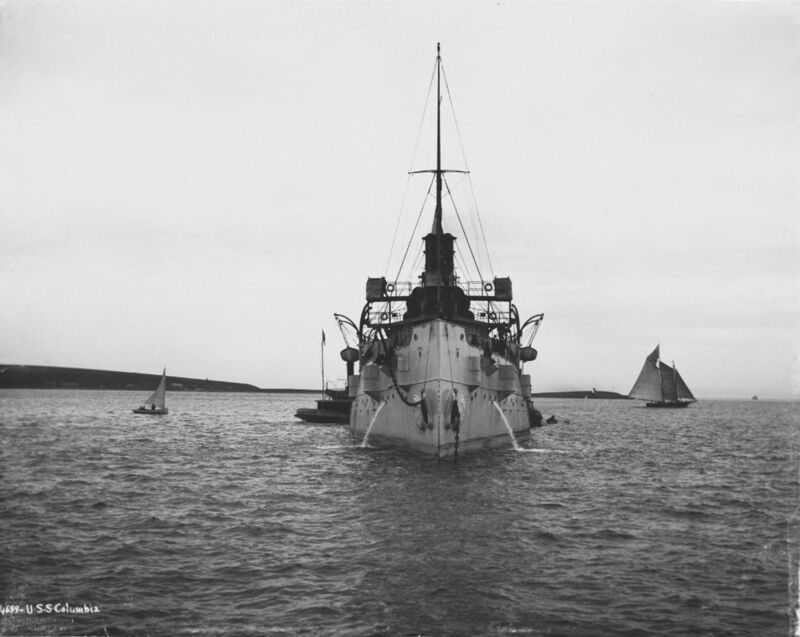 Stern view while at anchor on 13 November 1894, location unknown. Note the gangway to the tug that is alongside to port. 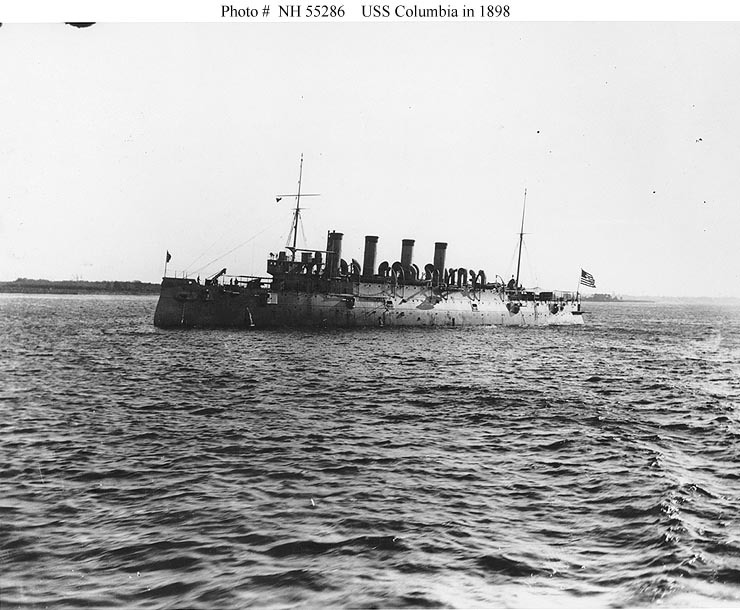 USS Columbia (Cruiser No. 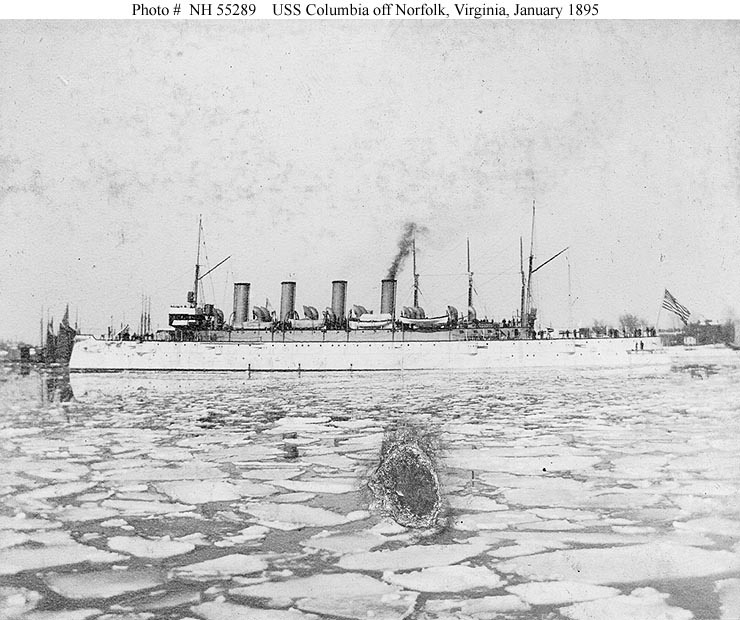 12) In icy water off Norfolk, Virginia, January 1895. 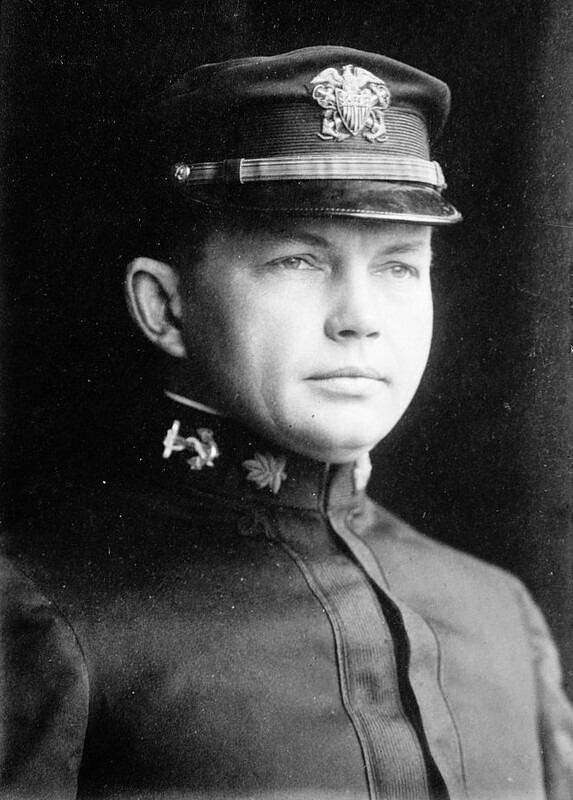 Collection of Rear Admiral Ammen C. Farenholt, USN(MC), 1931. U.S. Naval Historical Center Photograph #55289. 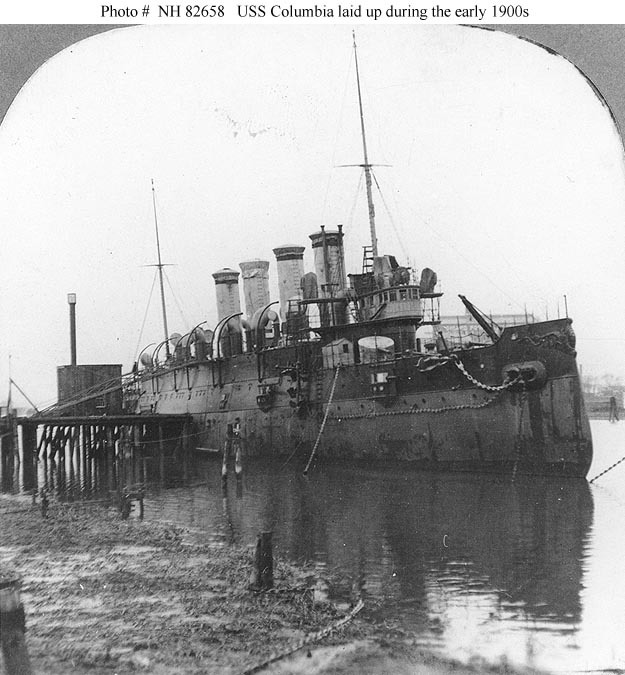 USS Columbia (Cruiser No. 12) Photograph taken in 1898 and printed on a stereograph card. Courtesy of Commander Donald J. Robinson, USN(MSC), 1975. U.S. Naval Historical Center Photograph #82657 . 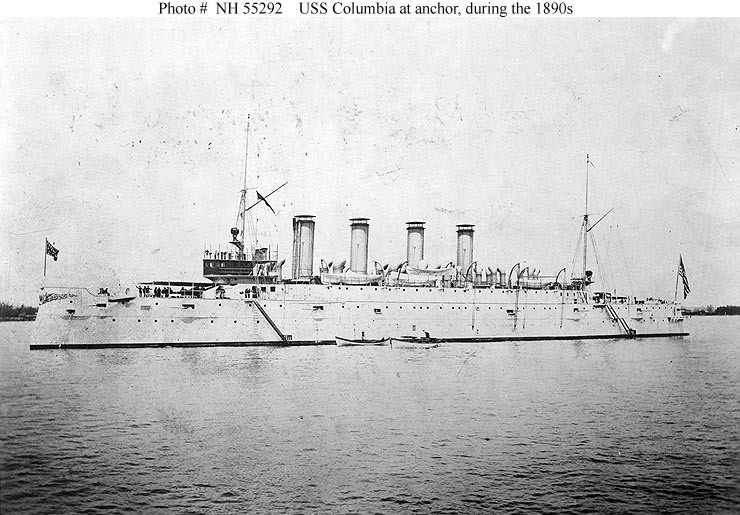 USS Columbia (Cruiser No. 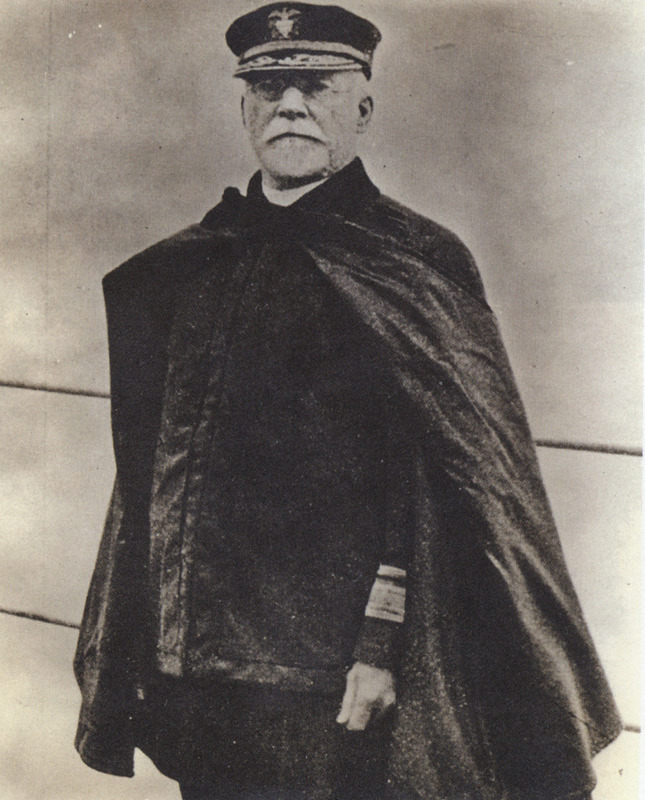 12) Photographed during the Spanish-American War, 1898. Courtesy of John S. Rowe. U.S. Naval Historical Center Photograph #55286. 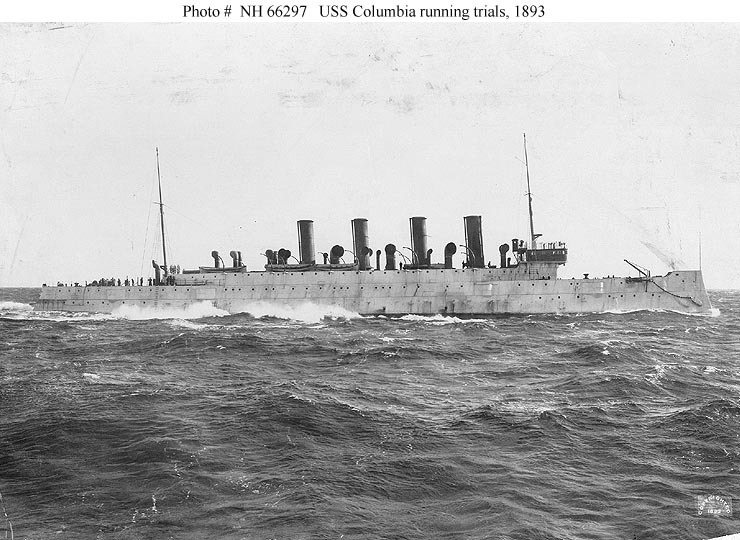 USS Columbia (Cruiser No. 12) Saluting during the naval review, off New York City, August 1898. U.S. Naval Historical Center Photograph #55287. 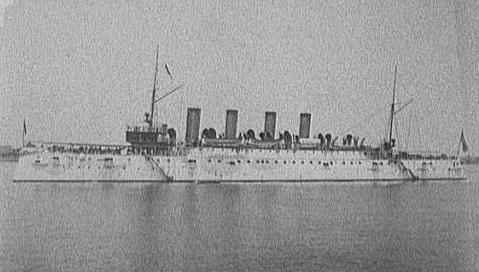 USS Columbia (Cruiser No. 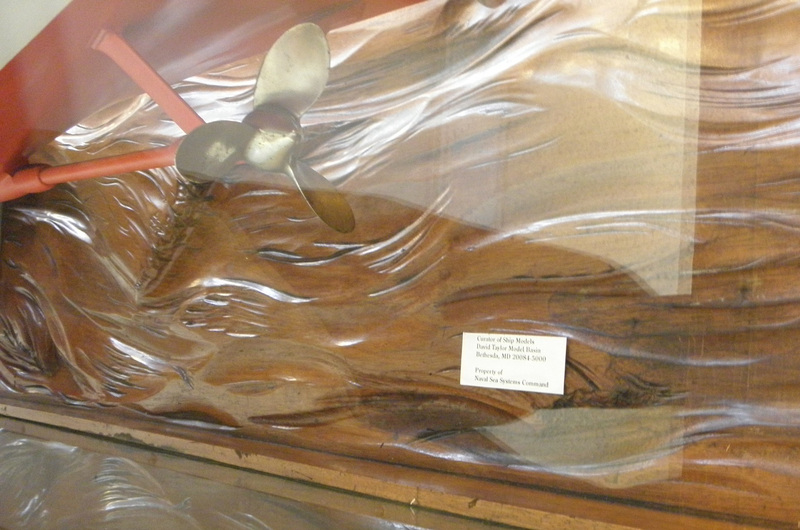 12) Laid up during the early 1900s. This photograph is printed on a stereograph card. Courtesy of Commander Donald J. Robinson, USN(MSC), 1975. U.S. Naval Historical Center Photograph #82658. 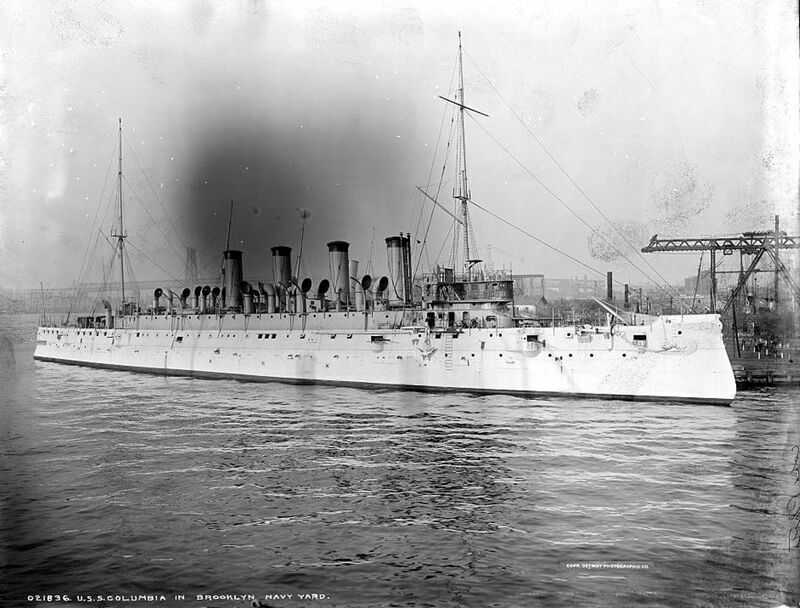 USS Columbia (Cruiser No. 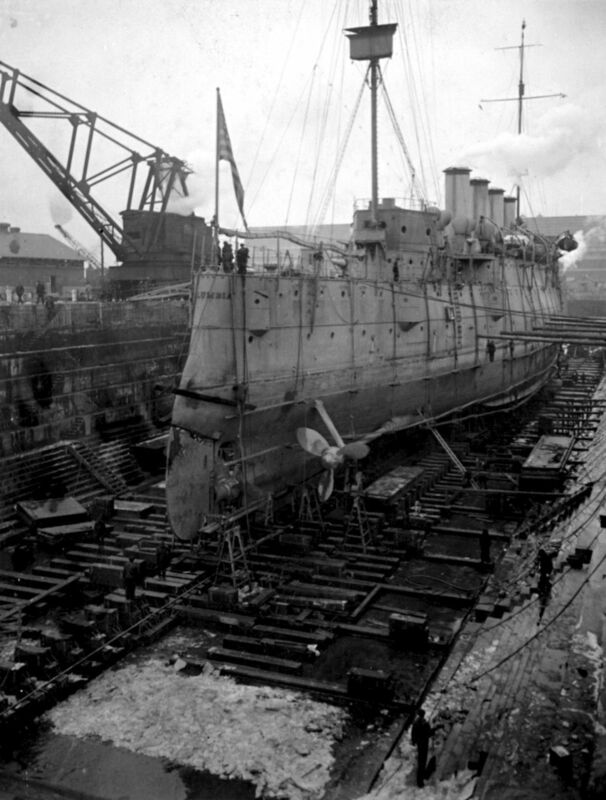 12) in Brooklyn Navy Yard, circa 1904. 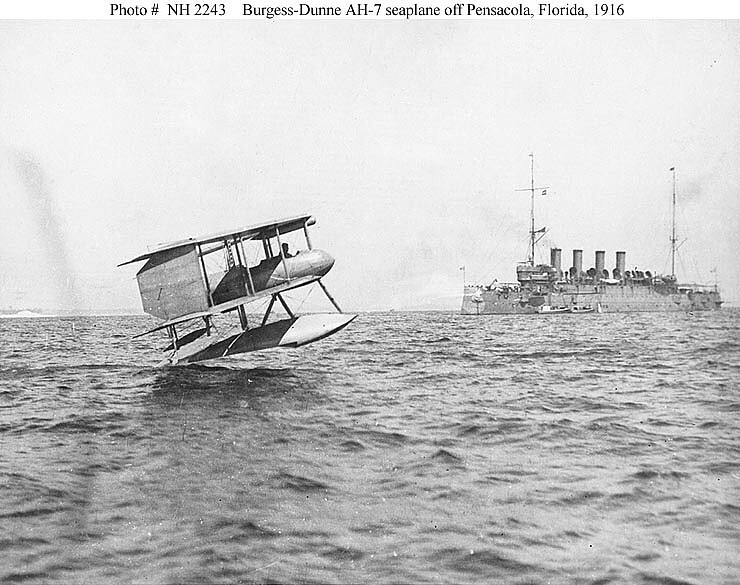 Burgess-Dunne AH-7 seaplane Flying just over the water off Pensacola, Florida, in March 1916. 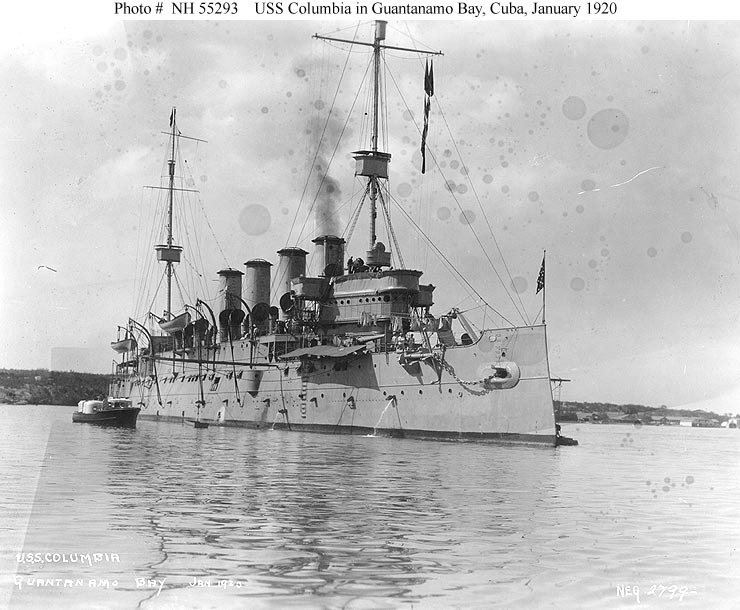 USS Columbia (Cruiser No. 12) is anchored in the right background. U.S. 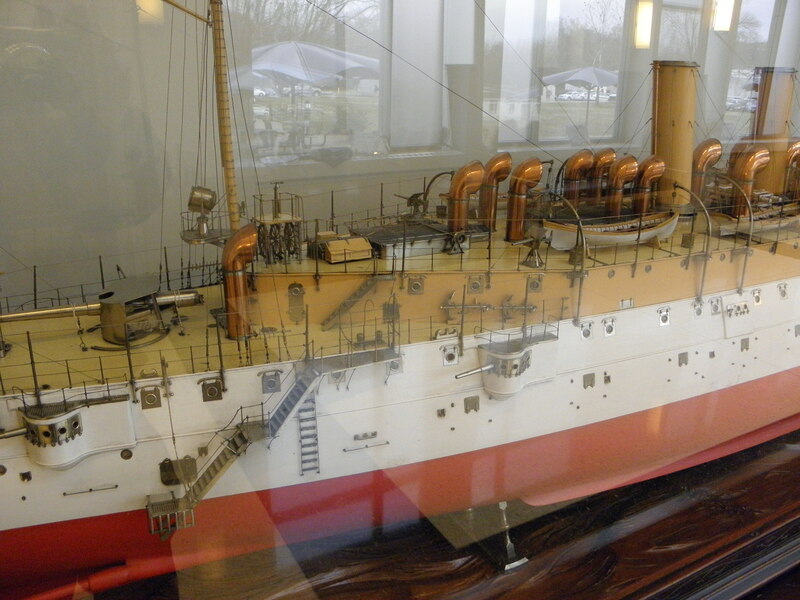 Naval Historical Center Photograph #NH 2243. 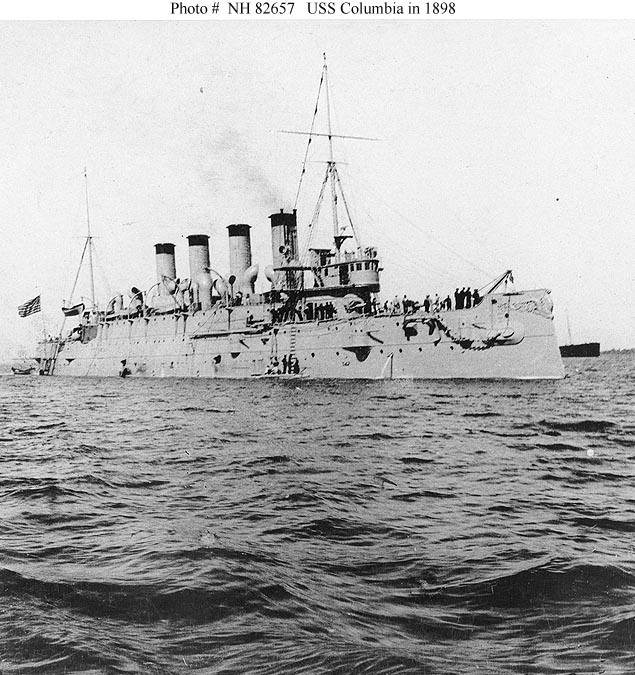 Starboard bow view while anchored at Hampton Roads on 13 December 1916. 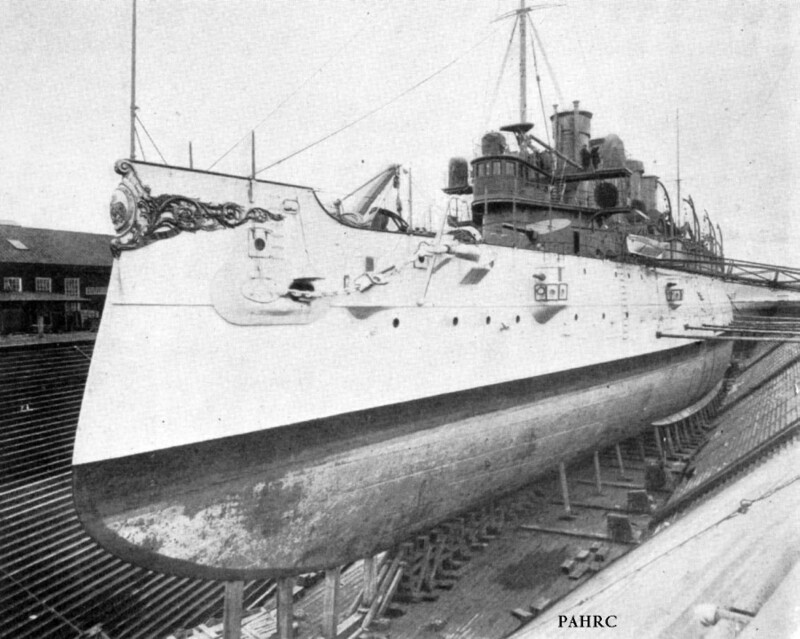 USS Columbia (C 12) in dry dock, Philadelphia Navy Yard, December 1919. 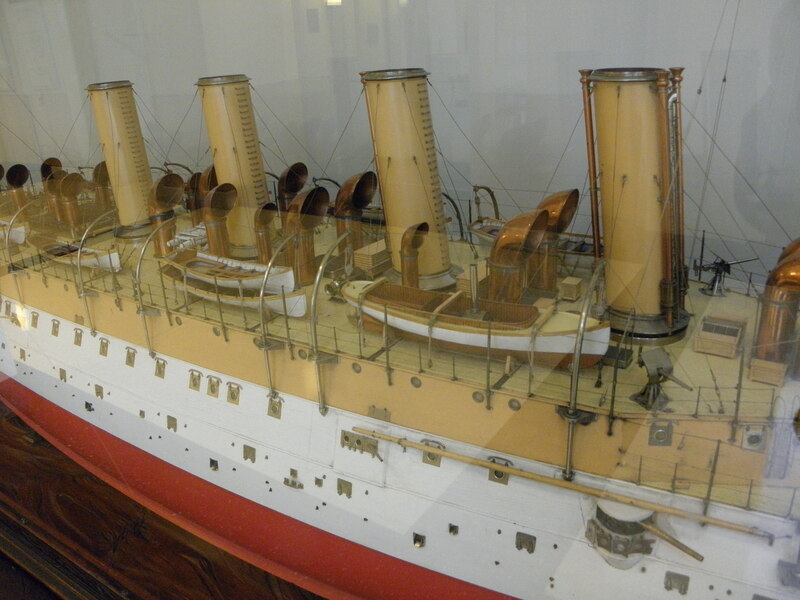 Note her triple screw configuration. 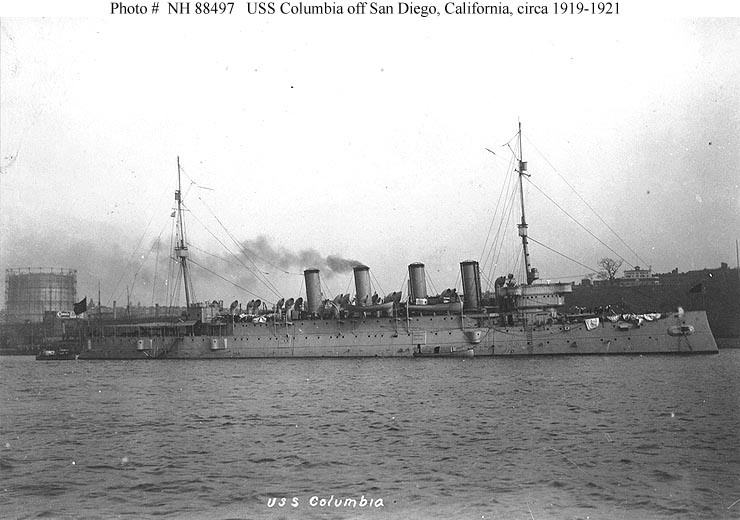 USS Columbia (Cruiser No. 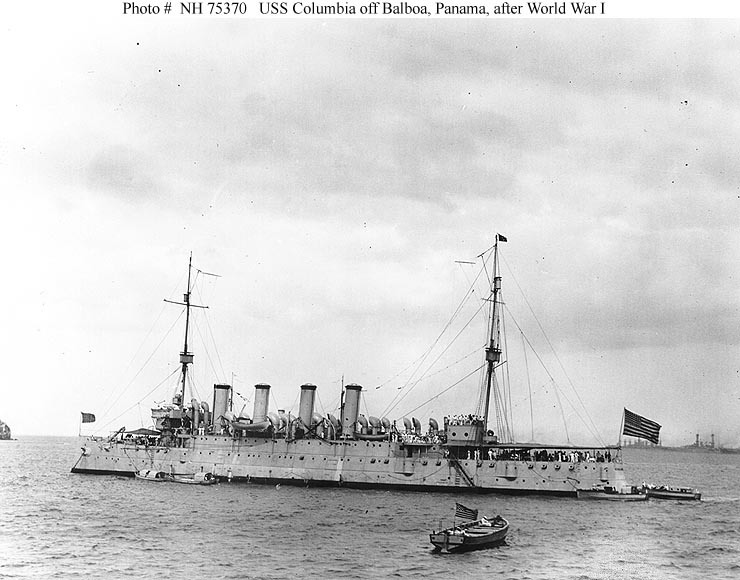 12, later CA 16) Off Balboa, Panama, with other ships of the fleet, after World War I. Note the 13-star "boat" flag on the launch in the foreground, and 48-star flag flown by the ship. U.S. 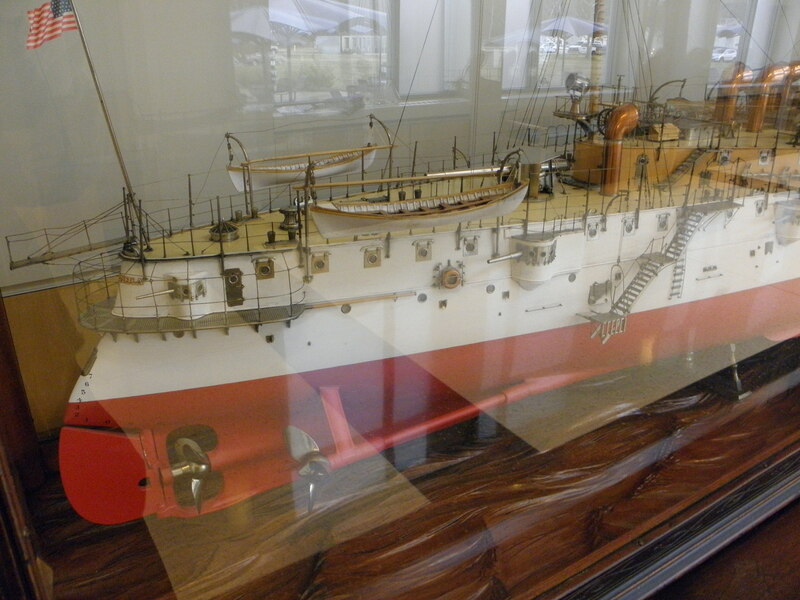 Naval Historical Center Photograph #75370. 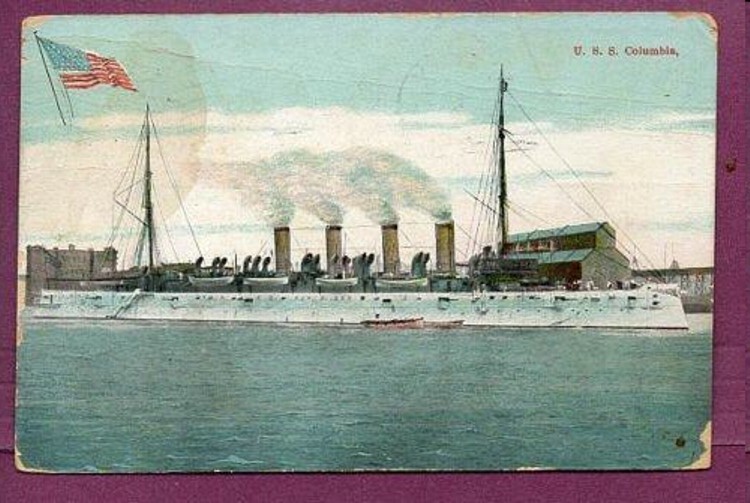 USS Columbia (Cruiser No. 12) In Guantanamo Bay, Cuba, January 1920. U.S. 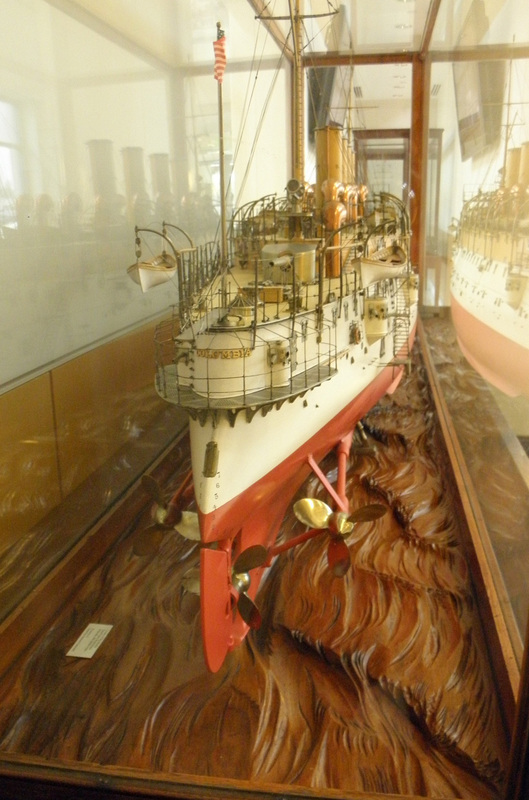 Naval Historical Center Photograph #55293. 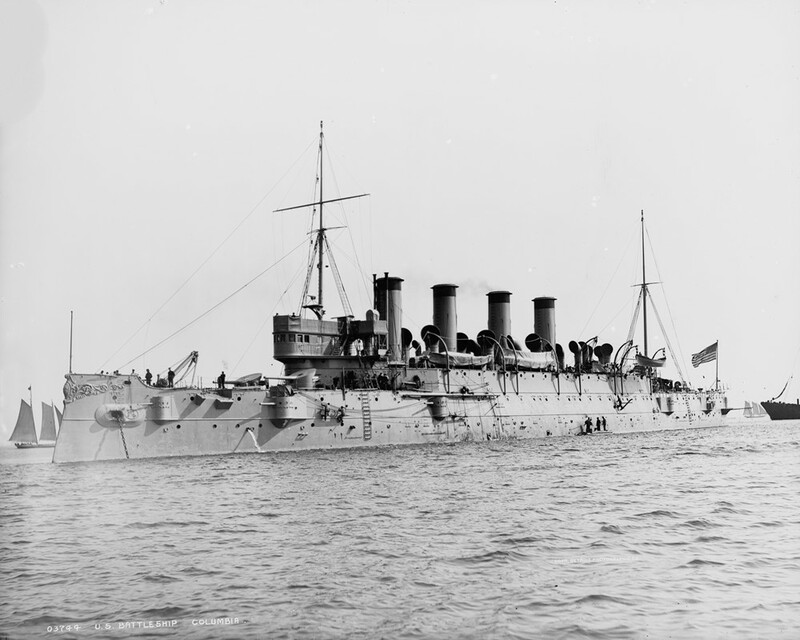 USS Columbia (Cruiser No. 12, later CA 16) Off San Diego, California, circa 1919-1921. Donation of the International Aerospace Hall of Fame, San Diego, 1978. U.S. 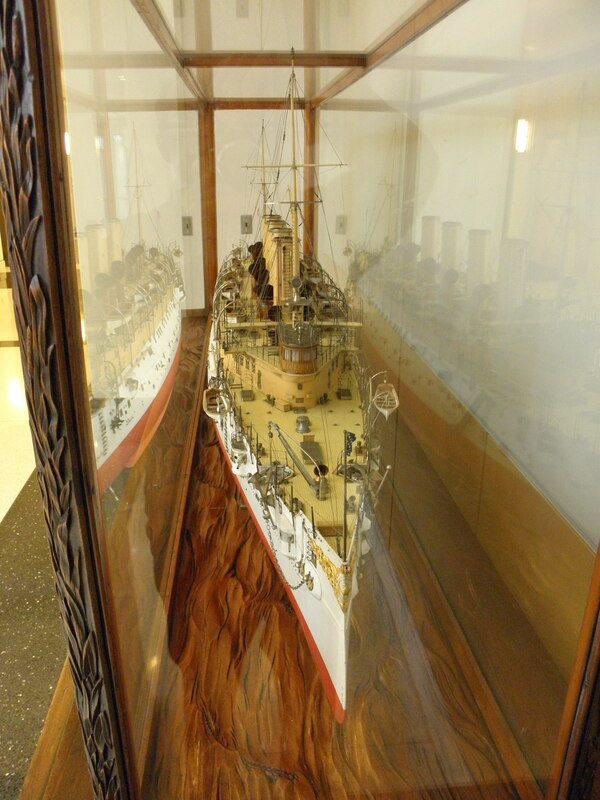 Naval Historical Center Photograph #88497 . 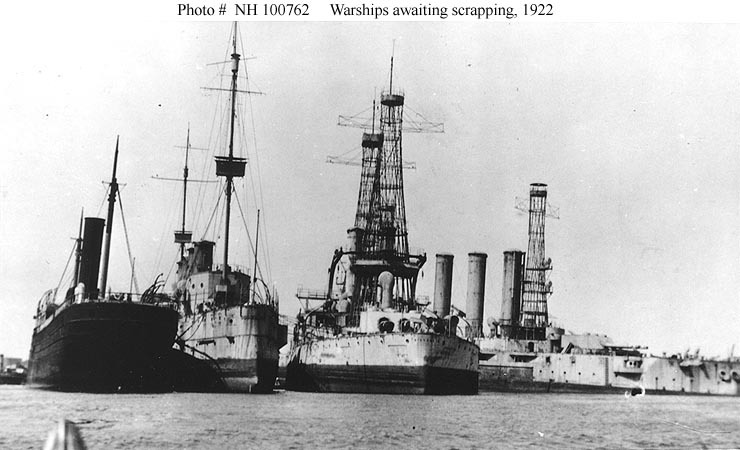 U.S. Navy warships awaiting scrapping, 1922 - Probably photographed at Philadelphia, Pennsylvania. 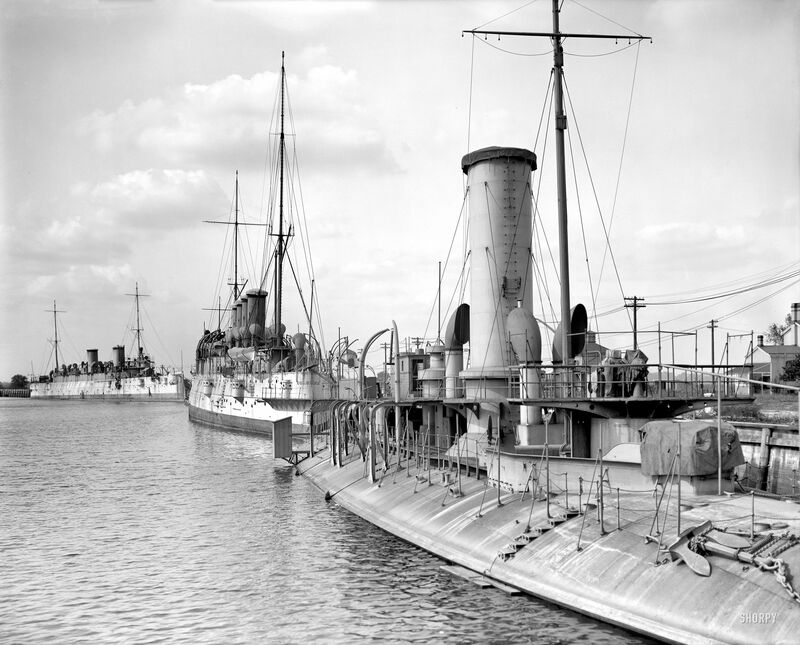 USS Maine (BB 10) is at right, down at the head with her side armor removed. USS Wisconsin (BB 9) is in the center. 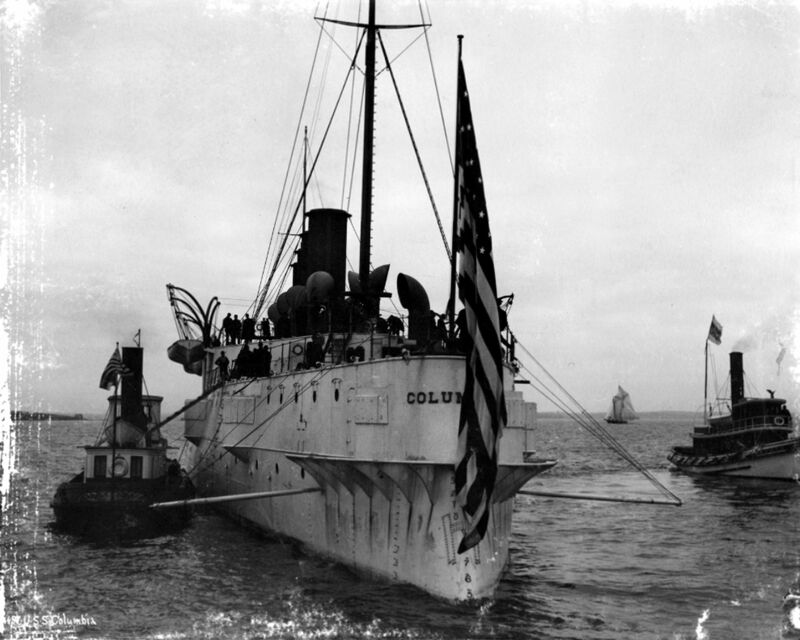 USS Old Columbia, ex-Columbia (CA 16) is toward the left, with a merchant ship alongside. Courtesy of Paul H. Silverstone, 1986. U.S. 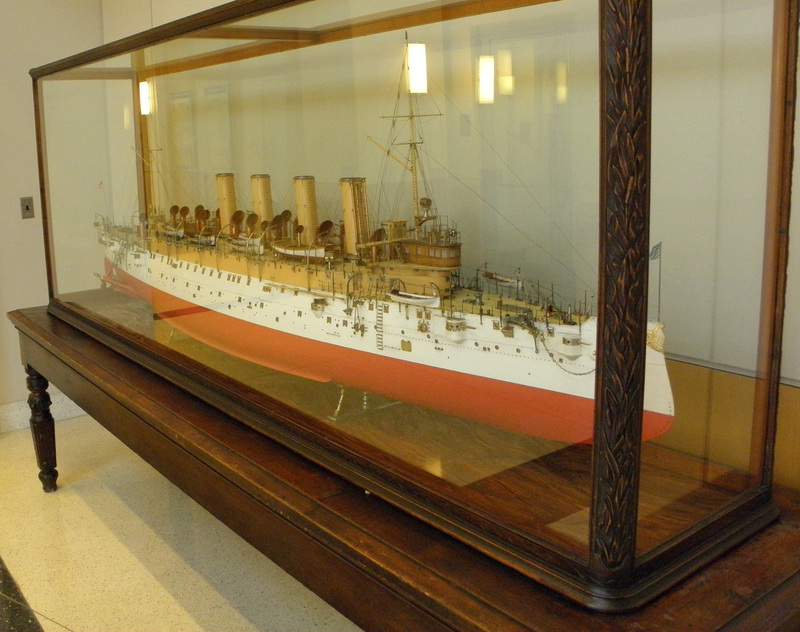 Naval Historical Center Photograph #NH 100762 .